An awful (and I do mean awful!) lot of scrum adoptions I have observed are quite shallow. Shallow in their scope, shallow in their understanding, shallow in their impact. These are often external trainers or consultants who have a few classes to sell and they approach the engagement at just the team level. There is a limit to the impact precisely because the scope is limited to the teams and not the larger organization. This is very appealing to the existing management as the implicit message is: scrum is a technical thingy we apply like a coat of paint on my people. The smallish dot in the yin yang is representative of such small thinking. Yin Yang represents harmony and balance, and the eternal play between two forces. I believe that a proper agile adoption includes a substantial amount of work transforming the larger organization. Unlike the previous paragraph, scum is most definitely not a technical thingy applied like a coat of paint. It has implications all the way up the organization, affecting how we think about recruiting, compensation, performance reviews, retention, reward systems, budgeting, org structures and a raft of other organizational issues. This does indeed include that standard Scrum 101 training for the teams, but that turns out to be a teenie part of the bigger picture. The other half of our Yin Yang is the orthogonal but oh, so complimentary technical practices. To be clear: you do not need to be using agile anything to leverage good technical practices, and you should always be trying to apply sound craftsmanship. 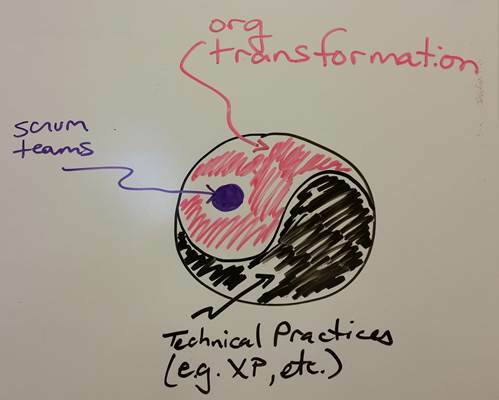 That said, there are positive feedback loops that scrum reinforces that amplify solid technical practices. When you strive to deliver to production every two weeks, then every week, then every day, you take automated testing at all levels, and continuous improvement, continuous integration and continuous delivery (three different concepts) very, very seriously indeed. If you are starting your journey, keep in mind this balance, and look askance at hucksters with solutions that only address half, or worse just the teams and not the larger organizational issues. Everything you omit is still there, waiting to bite you. Previous PostHow Much Should I Prepare for PBR?Next PostWhere Do Inventions Come From?